You’ve heard the pitch: Christian Bale, Heath Ledger, Ben Whishaw, Richard Gere, Cate Blanchett (!!! ), and a little black kid all play Bob Dylan. How innovative. 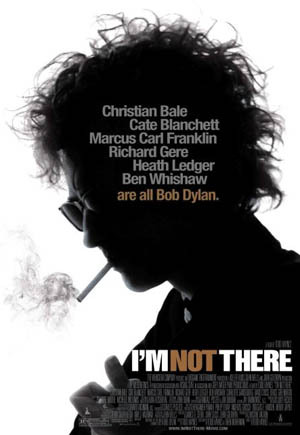 Each character in I’m Not There is supposed to show a different side of the Bob Dylan myth, some of which spell it out for you through the characters’ names – Arthur Rimbaud, Woody Guthrie, Billy the Kid, – while the more iconic, recognizable Dylans get names like Jude Quinn and Jack Rollins. And then there’s one, Robbie Clark, who’s both an actor hired to portray Jack Rollins and a stand-in for Dylan. Got it? Great, now forget everything I just told you. But is it watchable? Yes, immensely. Do you have to know anything about Dylan? It helps to have a basic acquaintance with the many disparate stages of his career, and depending on how much you know, some sequences may be more or less entertaining to you. Blanchett gets to have the most fun as the mid-’60s, iconic Bob Dylan, and it’s probably intentional on Haynes’ part that Blanchett’s Dylan is the most “realistic.” Sorry for the scare quotes, but with Dylan, you have to avoid words like “realistic.” Oops, there’s the quotes again. And there you have the essence of what you’re watching: A film that’s not afraid to confront Dylan’s many myths (which he’s been cultivating since the ’60s) in a way that’s playful, arty, and sometimes iconoclastic. It’s the way that Dylan might portray Dylan – if he were someone else. It’s a long film – two hours and some change – and if you’re like most people in the audience, you’ll sleep through Richard Gere. I personally didn’t have any problems with his sequences, which were whimsical and visually stunning. But I’ll readily agree that he doesn’t (and can’t) stand up to Blanchett, based on the material each is working with. There were times I found myself checking my watch, but the film does an admirable job of keeping you invested in such a disjointed plot line. Part of that might be the endless stream of Dylan songs, which make for most of the film’s background music. I’d recommend the film to any music fan. Here’s the crux of the matter: How does this film succeed while this year’s other big ’60s graverobber flick fails so miserably? Let’s look at both films as dealing with myth. In Across the Universe, it was the “all you need is love” myth of the Beatles, and the film bought into that myth so wholeheartedly that we were left with a hollow plot whose main character (unintentionally, I think) did little more than escape his world, just like the Beatles. It’s not a film about myth; it’s a film that presupposes the myth and fails because it can’t escape it. I’m Not There, meanwhile, is a film about Dylan’s myth and embraces the idea that so much of what we think of our favorite artists is constructed – by us, by critics, and many times by the artists themselves. It’s a challenging film, but not in the ways you might expect it to be. So don’t leave saying “I don’t get it.” You do get it. This is the film for anyone who’s ever lamented their favorite band for selling out, for anyone who’s fallen in love with an artist after reading a review of them. The key lies in the title, and in the final, extended shot of the real Dylan ad-libbing over “Like a Rolling Stone.” Underneath that constant re-invention, is he there?